For $9,000, I expect the best, but this bulking behemoth is shackled to a low-resolution screen. How much is too much? Even better, why not more? That's the question Acer's Predator 21 X asks by purely existing. An exercise in excess, the 21 X is a behemoth of a laptop—if you can even call it one—that crams every possible bell, whistle, and kitchen sink you can think of inside its, not-so-svelte, frame. Except when it doesn't. 21-inch curved ultrawide screen? Check. Full-size mechanical keyboard? Check. Top-end internals? Check. But a high-resolution panel? Nope. Connectivity: 1x HDMI, 1x DisplayPort, 4x USB 3.0 ports, 1x USB 3.1 Type C Port, Audio line in, Headphone Jack. Before we get to that questionable design choice, let's talk about what it's like to use a laptop that's upwards of four times more expensive than a high-end desktop machine. Of course, laptop is a bit of a misnomer. Sure, it's an all-in-one system with a mousepad, keyboard, and screen that folds down in a clamshell—you know, the traditional hallmarks of what we call a "laptop"—but this is not the kind of machine you would situate on your lap. First off, it weighs more than 18 pounds, not including the two massive 330W power bricks. That alone should be enough reason, but there's also the front-situated keyboard that makes general use awkward, not to mention the massive fans spitting hot air out of the back. Ouch. Portable desktop-replacement would be more accurate. But even then, is the Predator 21 X even that portable? It's not exactly the kind of rig you can toss in a backpack and take through airport security. In fact, the system ships with its own custom Pelican carrying case—a gargantuan wheeled box that you might expect to house a photographer's entire livelihood. The (even larger) cardboard box it shipped in was so big that we were able to fit MaximumPC EIC Tuan Nguyen completely inside. Solid Snake would have been proud. 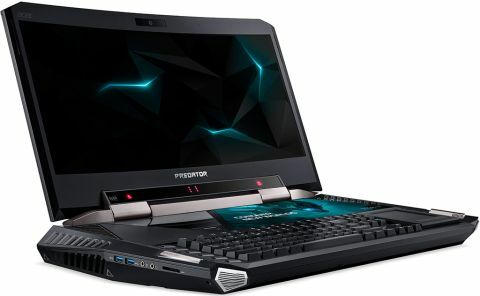 All of this is to say that the Predator 21 X is hardly portable, which for something billed as a laptop, amounts to a contradiction that in many ways sums up the machine as a whole. This is the system that asks "why not?" And yet, we still find ourselves asking "why?" For all the power and engineering crammed inside, it's saddled with a comparatively low resolution panel that clocks in at a mere 1080p. About that power. The Predator 21 X is outfitted with a nice suite of top-end internals. An Intel Core i7-7820HK pairs with 64GB (because why not?) of DDR4-2400 RAM. Primary storage is handled by two 512GB PCIe SSDs in RAID 0 configuration (again, why not? ), with a backup 1TB SATA HDD for good measure. And for pixel-pushing, two GeForce GTX 1080s in SLI. Why not, indeed. If you've paid attention to some of my previous dual-GPU system reviews, you may remember a common thread: SLI does not play nice with 1080p. Most dual-GPU laptops we’ve tested before sported 4K screens, and top-end dual-GPU rigs are usually similarly intended for higher-resolution gaming—if not at 4K, then 1440p at 144Hz. And yet here we are: two GTX 1080s in SLI chained to a criminally low resolution 1080p panel. Now, it's worth noting that the Predator 21 X's panel is indeed a 21:9 ultrawide format, meaning the actual resolution is 2560 x 1080, as opposed to the standard 1920 x 1080. But even so, we found the lower resolutions issues with SLI performance to exist nonetheless. In some games, SLI played nice and offered framerates in the realm we expected. The Division, for example, which consistently returned a score of 115fps with SLI enabled using its built-in benchmark on the highest available graphics preset, as opposed to 81fps without SLI. Far Cry Primal was a different story. That game also scored around 81fps without SLI, but the framerate dropped down to an average of 63fps with SLI turned on. Rise of the Tomb Raider had the same issue. Without SLI, the game's three-part benchmark returned an average of 103fps. With SLI turned on, that score dropped to 80fps. To make matters even more confusing, enabling DirectX 12 seemed to help SLI performance—raising the score up to 127fps on average, but also introducing extremely noticeable bouts of lagging frames. Not exactly an enjoyable viewing experience. All of this is to say: why? For all the excessive, "shoot-the-moon" attitude that went into the Predator 21 X, why not go all the way and outfit it with a proper screen. It doesn't even have to be 4K—we'd be plenty happy with a high-refresh-rate 1440p panel. But 1080p? That's unacceptable. For $9,000, we expect the best.